Along with the nearly contemporaneous Mad Max movies, but surely more visually convincing, Blade Runner showed a future world that actually looked like it could be the messy result of accretion from the time we live in now, rather than the pristine white worlds of previous future-fictions, (Things to Come, 1936, Logan's Run 1974); that featured hard-to-believe tabulae-rasae where no inkling of the world that led up to it was recognizable. 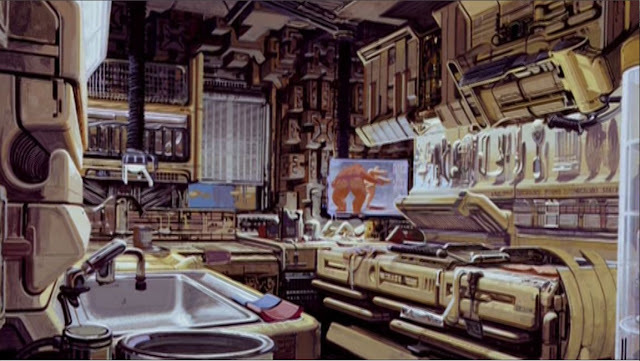 With the imaginings of this film's "visual futurist" Syd Mead, the selectively edited interiors of F.L.Wright's 1924 Ennis House, and the direction of Ridley Scott, the residential interiors of hard-boiled cop Deckard reveal the lived-in layers of time, at once suggesting the gritty detritus of a post-apocalyptic future, (to repell us), the shadows of 1940s film-noir (to put us on edge), and the romantic remains of mid-20th century home life (to draw us in). Together, these vicissitudes serve to excite and to mesmerize, and make believable a story that at its center asks the question of what makes us human, and answers with a troublingly elusive but instructive truth: our memories. Frank Lloyd Wright's custom designed concrete blocks for the Ennis House.